Another nice weekend for a walk. Again, it was a little chilly, but nice weather. The tube ride to Boston Manor was uneventful. After a quick walk to the start of the section, we started our walk. Just as we ended the last walk wandering along the Grand Union canal, this walk started with a little bit of the same. 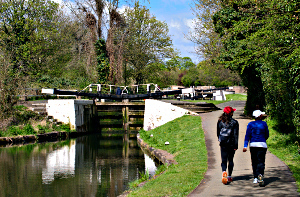 After passing by Osterley Lock we soon however left the canal, just before getting to the triple locks of Hanwell Lock. Instead of the canal, we started following the river Brent through a meadow. Near Uxbridge road, the original Ring went under the bridge, but it has now been diverted. The incredible amount of stinking mud under the bridge was probably the reason. Good thing that I can't smell really. After figuring out the diversion, we ended up on a grassy field with a Heathrow Express train going over the Wharncliffe Viaduct. Passing underneath the Victorian structure brought us to Brent Lodge Park, also called "Bunny Park". I think I prefer the latter name. We followed the river through the park for a bit, and spotted some parakeets. Literally every single park we have come through seem to be full of them. Apparently they thrive well in the London parks! The park also features the Millennium Maze, but that is something for another time. After leaving the bunnies, we cross over the Brent Valley Public Golf Course, and were nearly hit by a flying golf ball (not really). From there on we continued past Bittern Field (a format garbage dump). Crossing Ruislip Road brought us to Perivale Park with its open spaces and playing fields. From there on we crossed the busy Western Avenue (A40) over the footbridge and past the tube railway to end up at Greenford. The end of section 8. Right at the start of section 9 is the Westway Cross Retail Park, with some shops and fast food outlets. Not knowing what would come, we decided we wanted some proper food, like an upcoming café. We left the retail park behind and crossed through the Paradise Fields nature reserve to end up at the Grand Union Canal_ again, but this time the Paddington Branch. 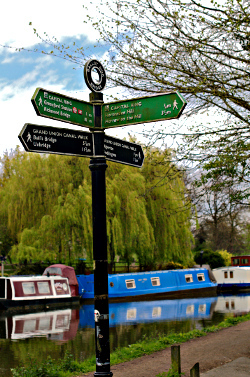 Technically, we can follow this all the way home, near Little Venice. Instead we left it behind at Ballot Box Bridge to get some well deserved tea and cake at the Horsenden Hill Visitors' Centre. Unfortunately, it was closed. Or rather, there was hardly any sign that there is normally a visitors centre. The loos were locked too. So without the cake and tea, we had to climb Horsenden Hill. The view wasn't spectacular, and we were getting a little bit grumpy due to no food. Luckily at the bottom of the bill would be a pub, the Ballot Box. After descending through a path of mud (we got more grumpier), we finally ended up at the pub, only to find it closed as it was being refurbished/changed into a Hungry Horse. The parade across the road wasn't particularly useful either for food. More grumps. The next possibility to get some food would be in Sudburry Hill, but that required another climb. It's called Sudburry Hill for a reason. Sadly, when getting there we found nothing to our taste. Our last chance for lunch would be Harrow-on-the-Hill. As the name suggests again, it was up a hill. But here we finally found a lunch place to our liking. The little creperie/art gallery Battels does wonderful crêpes, albeit with a little wait. Service wasn't great, and slow, but the food was good, and frankly we really deserved it after all these hills! From here on, it would be only another two miles hike to the end of section 9. 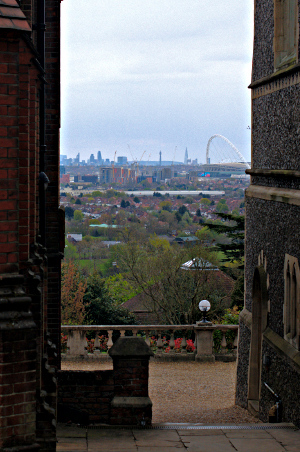 The first bit was through the grounds of Harrow School, and the last bit past the Northwick Park Hospital and the Northwick Park golf course. Arriving at South Kenton, it was only a short tube ride back home for a well deserved pint. For the full photo series, see my Flickr set.